Oh kimchi, how I love you so. 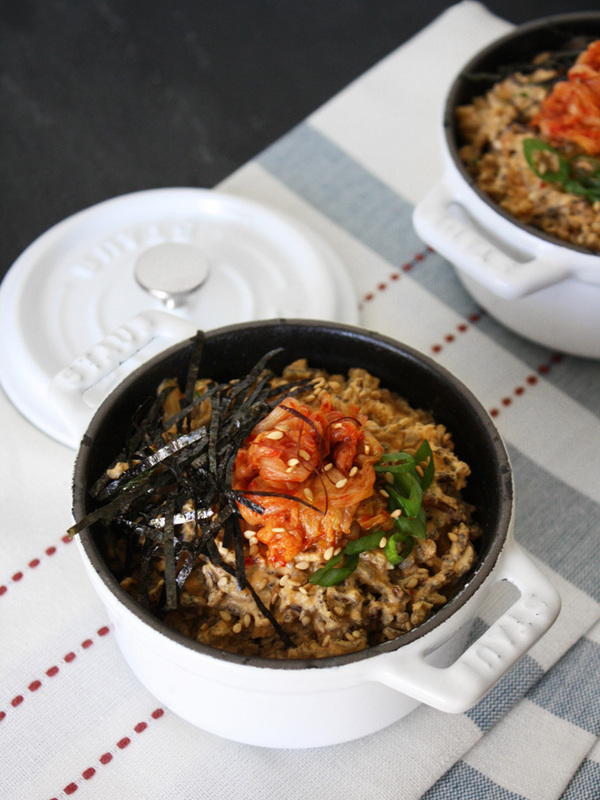 If you are a kimchi lover like me, you are constantly thinking about how to incorporate more kimchi into your dishes. 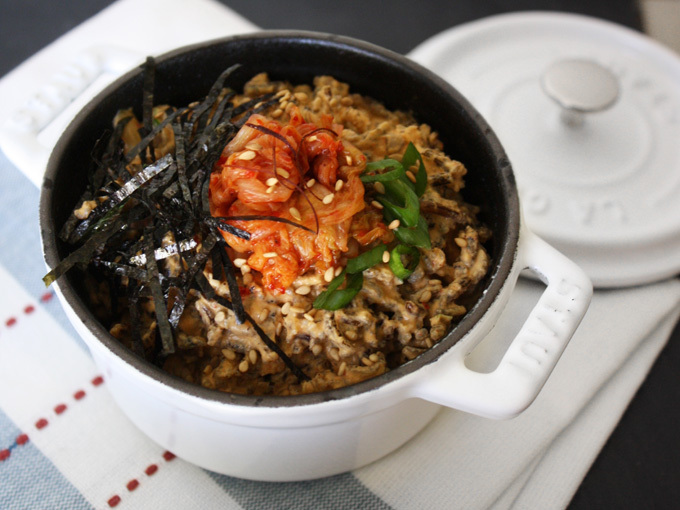 Since I love rice dishes and kimchi, this raw vegan kimchi risotto recipe was a no brainer. Wild rice is one of my favorite ingredients to use, and is very nutritious and satiating. So this creamy kimchi risotto makes a perfect dinner for when you want something filling and substantial. It is also chock full or probiotics and healthy enzymes from the fermentation. Your gut will thank you for it! To make this recipe, you need to prep the wild rice by soaking or “blooming it.” First, let me quickly touch on wild rice in case you aren’t familiar with it. Though wild rice is named “rice”, it is a water-grass seed, not a grain. It is packed with protein, anti-oxidants, vitamins and minerals, and has a nutty flavor. 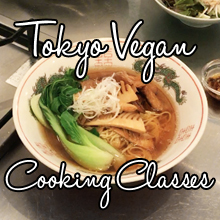 For raw cooking, you prepare the rice by “scoring” and then blooming it (soaking), which results in a nice al dente texture. Check out how to bloom the wild rice here. I recommend starting to soak the cashews for the kimchi sauce 2-4 hours before you are finished soaking the wild rice, so that it will be ready to go all at once. When the wild rice and cashews are done soaking, drain and rinse well. Transfer the wild rice into a larger bowl. Now that the cashews are soaked and ready, we will make the kimchi sauce. Add all of the kimchi sauce ingredients into the blender and blend until smooth. 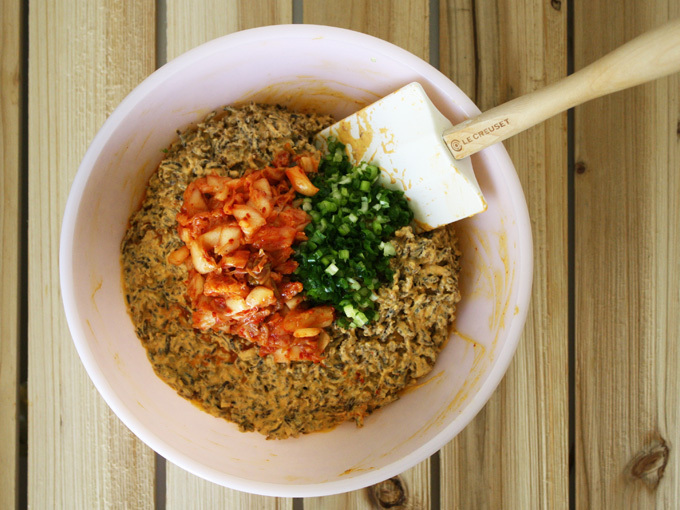 Pour the kimchi sauce over the wild rice and mix well until the wild rice is evenly coated with the sauce. Add in some roughly chopped kimchi and minced green onion and lightly toss. Cover the bowl with saran wrap and let it chill in the refregirator for a couple of hours to let the flavors sink in and intensify. If you own a dehydrator, skip the refrigeration step and instead, line the dehydrator tray with a silicone sheet, and warm it up in the dehydrator for a couple of hours at 115℉ (46℃). When you are ready to serve, plate it and top with with some kimchi, sliced green onions, thinly cut nori sheets, and sesame seeds. If you love kimchi, then you are in for a treat! Some more kimchi, thinly sliced green onions, thinly cut nori sheets, and sesame seeds for garnish. 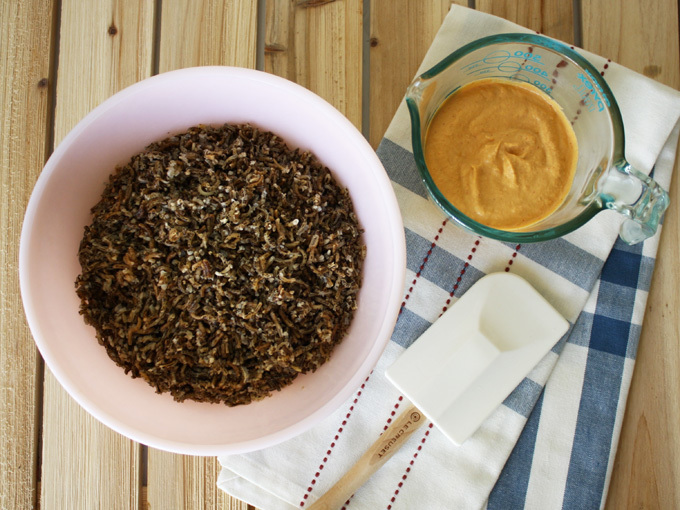 Score the wild rice for one full minute in the food processor. You have to continuously keep it running, so no pulsing here. FYI, it can be quite loud so I usually get out of the kitchen while it's scoring. When it's done, make sure the wild rice is covered with black powder. If it's not, it's a sign it's not scored enough so keep it running a little longer. Place it into a large mason jar like the half gallon size, or a very large bowl. Pour in enough water to soak and cover it. Let it sit for 12-18 hours. Caution: Make sure the jar or bowl you use has enough room for the rice to expand 2.5 - 3 times. Start soaking the cashews for the kimchi sauce 2-4 hours before you are finished blooming the rice, so that everything is ready to go when the wild rice is ready. Once the rice is bloomed, rinse and drain. Transfer the wild rice into a larger bowl. Soak the cashews for 2-4 hours. Drain and rinse well. 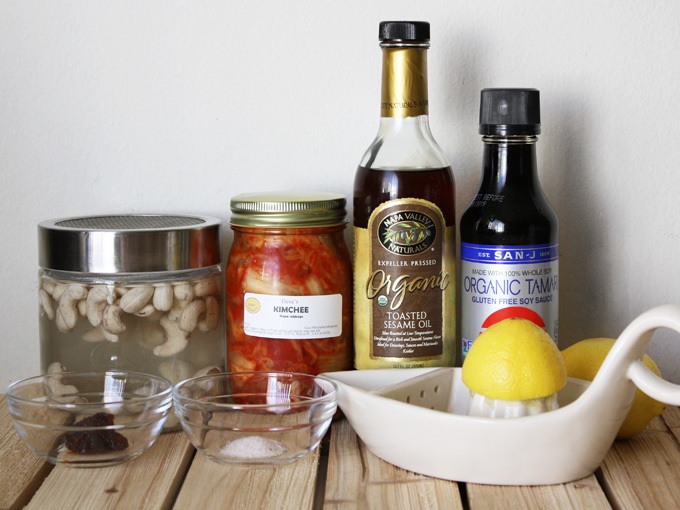 Add the ingredients for the kimchi sauce into the blender, and blend until smooth. If you are using a Vitamix, use the tamper to make the sauce nice and smooth. 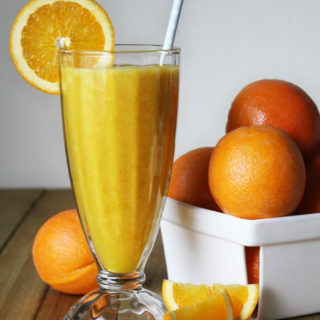 If you are using a normal blender and having a hard time getting it smooth, add a little bit of water at a time until it blends into a smooth cream. You only want to use the minimum amount of water to make it smooth and no more. 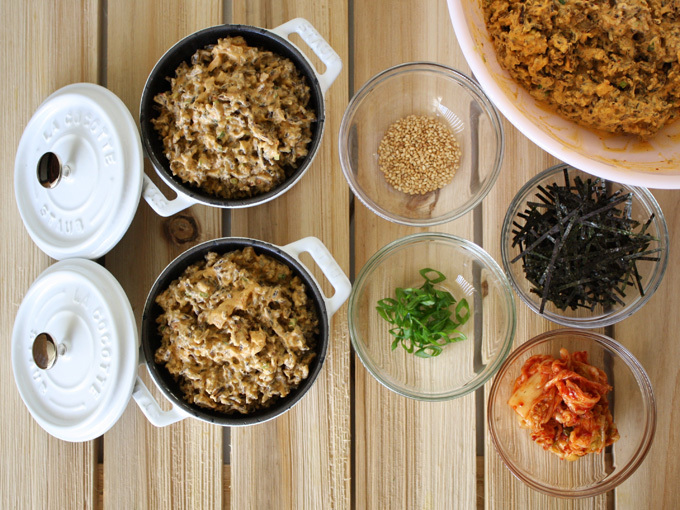 Mix the kimchi sauce into the wild rice, and toss well until the sauce evenly coats all the rice. Add in the roughly chopped kimchi and minced green onions and toss lightly. Cover the bowl with saran wrap and chill in the refregirator for a couple of hours so that the flavors can sink in and intensify. If you own a dehydrator, do not refrigerate. Instead, line the tray with a mesh sheet, then a silicone sheet. Spread out the wild rice mixture thinly and evenly and dry it at 115℉ (46℃) for 2 hours to warm it up. Mix the risotto again before you plate. Plate and top with some more kimchi, sliced green onions, thinly cut nori sheets, and sesame seeds. Store in an air-tight container in the refrigerator. Keeps for 4 days.